Ashida Mana performs her first solo single "Suteki na Nichiyobi ~Gyu Gyu good day!~"
Although Mana-chan has sung the theme song and runaway hit, �Maru?Maru?Mori?Mori!,� �for the drama �Marumo no Okite� (Fuji TV) with her co-star in the drama Suzuki Fuku-kun as the unit �Kaoru to Tomoki, Tama ni Mukku,� this is her first solo release. �The song will be released for sale on October 26th. The new CM is part of the fall season excursion campaign, �Aki no Odekake Fair� for Seven & I group�s holdings 7-Eleven Japan, Itoyokado, Sogo?Seibu, and 7netshopping. Mana-chan�s cute singing voice and dance gives the atmosphere of a family outing, the concept of their campaign. �The campaign is set for release on September 27th. Is Kumada Yoko in a relationship with a handsome salaryman? 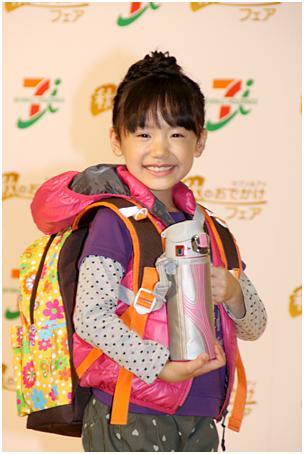 Hirosue Ryoko to star in upcoming drama, "11 Nin mo Iru!"